Pond water may occasionally turn pink, which can be alarming for pond owners who see it for the first time. Below is an explanation of why this occurs, what should be done about it, and whether or not you should be worried. What Makes The Water Turn Pink? The pink color results from a sulphur bacterium that grows due to excessive debris at the pond’s bottom. This debris creates hydrogen sulphide gas in large amounts, the same gas which is responsible for the infamous rotten egg smell. Sulphur bacteria utilize hydrogen sulphide rather than water to fuel their photosynthesis. Is The Pink Water An Indication Of Pollution? Not necessarily. Sometimes the water will change color as a result of plant debris buildup which is completely natural. But it may also be an indication that sewage or deteriorating organic matter is present. A bloom in plankton can also give water a pinkish color. The phenomenon is most often seen in ponds which are fresh, but can also occur in brackish water as well. While a number of factors can cause pond water to become pink, what is indisputable is that such water has a heavy presence of organic matter. The best way to know what is happening for certain is to analyze a water sample using a microscope. Research indicates that pink pond water is usually caused by plankton which is a type of dinoflagellates. When water acquires an elevated concentration of these organisms, it results in the water displaying a pinkish hue. Should Pond Owners Be Concerned? Yes. Anytime pond water changes from its natural color to pink, brown or green should be cause for concern. In the case of pink pond water, the danger lies with the dinoflagellates, because some species produce red tides which can be hazardous to fish or other pond animals. It is best not to take any chances; if you notice that your pond water has turned pink, either resolve the issue yourself or contact a pond specialist for help, as soon as possible. A pond which is pink in color is one with a tremendous amount of nutrients. The best way to get rid of the pond water is to remove the debris from the bottom. Maintaining clean water at all times will ensure that it maintains its clear, natural color. In rare instances the pond may need to be deepened, so that it can handle a greater presence of plants and other organisms. Ponds are susceptible to closing in, and if left unchecked can cause them to disappear completely. 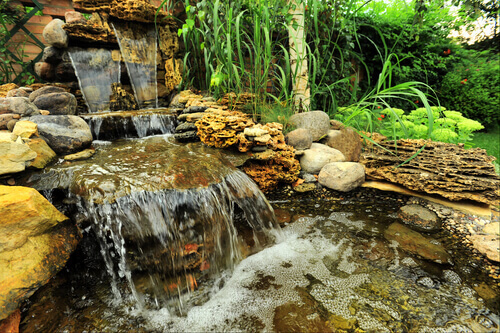 Keeping your pond water clean and at a balanced temperature is essential for the plants and animals within it. Water should be tested regularly to make sure it is well balanced; as degradation will occur gradually and can be difficult to spot visually until it’s too late.